Eagles head coach Doug Pederson watches as the Cowboys drive down the field in the 4th quarter of Sunday night’s 27-20 loss at Lincoln Financial Field. By this point, Doug Pederson should know his offense. But it took the Eagles coach more than a half to get out of the way and just allow Carson Wentz to be Carson Wentz. 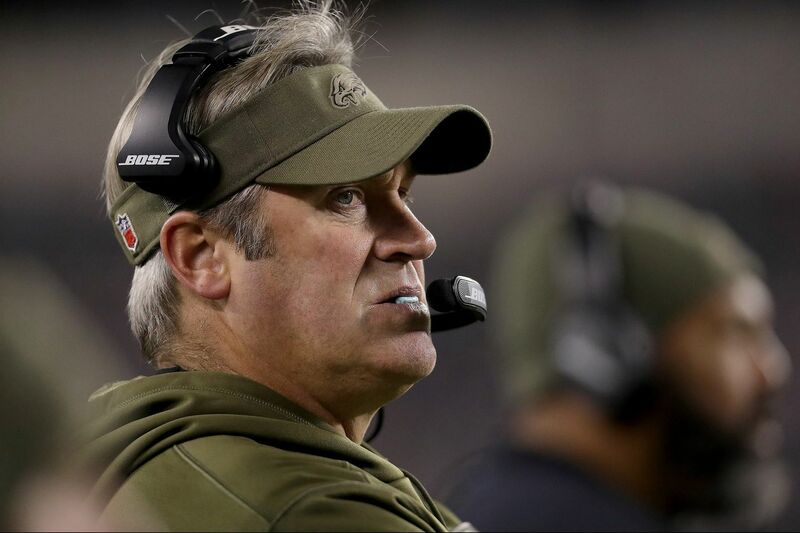 It was, ultimately, too late, and for that, Pederson will shoulder his share of the blame for the Eagles' deflating 27-20 loss to the Cowboys on Sunday night at Lincoln Financial Field. Defensive coordinator Jim Schwartz and many of the players own pieces to that pie. But Pederson, somehow, was out-coached by Jason Garrett. The Dallas coach was on life support. His offense is a relic. But it outpaced an Eagles offense that has scored more than 24 points only once this season. "Starting with myself, all of us, we just need to look at ourselves in the mirror," Pederson said. "Are we doing enough? Are we giving enough? Each week it's a strain." Speaking of a fading heartbeat, the Eagles' season is starting to slip away. They're 4-5, two games behind the NFC East-leading Redskins and they travel to face the electric 8-1 Saints in New Orleans next week. They still have two games against Washington and two more against Dallas and the New York Giants, but Pederson's team has showed an inability to sustain any of the fleeting momentum they've had over the first nine games. "We have to change who we are," Pederson said when asked if this was the true identity of his team. "Doesn't mean that we have to go out and grab a whole bunch of new players. We just got to continue to work, continue to coach and teach, and get better. We just got to do a little bit more each week. … We're close in a lot of areas." When you bow to the Cowboys Clapper at home, you're not close. Pederson has struggled to script a successful opening series. His playcalling in big spots has been suspect. He's gotten too cute with gimmicks. And he has taken the ball out of Wentz's hands far too often. The Eagles have had a rash of injuries. But that excuse wasn't used last year, even though they lost more key players. Wentz wasn't perfect by any means. He tossed another early interception. He failed again to deliver late in the game when he had the ball and a chance to either tie or go ahead. But Wentz didn't call the screen to Corey Clement on third down on the Dallas 30 with two minutes to go. The Eagles have been poor with screens for much of the season. The running backs haven't done much with the ball in their hands. He should have given Wentz (32 of 44 for 360 yards and two touchdowns) a chance to throw beyond the sticks. But Clement was brought down for a 5-yard loss. Cowboys linebacker Leighton Van Esch knifed by Eagles guard Brandon Brooks and made the tackle. "We anticipated pressure. We got it," Pederson said. "Trying to get the ball out and try to execute the play, and we failed to do that." And on fourth-and-seven a play later, tight end Zach Ertz's catch was short of the marker and that all but sealed the Eagles' fate. The ineptitude started on the Eagles' first possession, which has been a running theme this season. On first down, Wentz rolled right on a design that had Ertz block Demarcus Lawrence before releasing down field. He got knocked off his route and the pass netted only 1 yard. After Josh Adams was dropped for no gain on a run to the left, Wentz threw a screen pass to the newly-acquired Golden Tate on third down. The receiver is a yards-after-catch maestro, but nine yards was a lot to ask and he was dropped short of the marker. For the fifth time in nine games, the Eagles went three and out on their opening drive. There have myriad reasons for the lack of early production, but Pederson's scripted starts have been lackluster. Could it be the over-reliance on short passes to supplement the run game? Leighton Vander Esch runs past the Eagles’ Isaac Seumalo after Vander Esch intercepted Carson Wentz in the first quarter. Why not let your burgeoning quarterback throw the ball beyond the sticks a few times? Wentz did throw downfield on the next series, but he made a poor decision. He didn't see Vander Esch sitting underneath when he threw to Ertz on a skinny post and the ball went into the rookie linebacker's hands for an interception. It was Wentz's lowest moment of the night. He didn't have many, but it underscored the Eagles' overall issues in the early portion of games. They've scored only a total of 21 points (2.3 per game) in the first quarter this season. Last year, they averaged 6.6 points. "I don't want to talk about last year, but that was something we did really well last year," Wentz said. "It's just really hard to put your finger on why it is the way it is this year. A lot of it's just little execution things that are a big deal." Coming off his strong outing in London, Adams carried the early load on the ground. He benefited from an Ertz wham block and bolted 29 yards into Dallas territory early in the second quarter. But a third and one pass to Tate was broken up and on fourth down, Pederson erred with his play call. The Eagles trailed, 3-0, and had the ball on the Dallas 20. But rather than attempt a 38-yard field goal, Pederson — as he is wont to do — was aggressive. The odds were good. But it was a long yard and Wentz wouldn't be able to sneak. But rather than give Wentz — his best option — the ability to convert with his arm, Pederson called a run. If Jay Ajayi was healthy or LeGarrette Blount were still on the team, it might have been a high-percentage choice. Adams took the handoff and ran to his right. Lawrence blew up tackle Halapoulivaati Vaitai, Ertz missed his block and the tailback was dropped for a 3-yard loss. Vaitai was filling in for the injured Lane Johnson. He should be able to block that play up, but running behind him on a crucial down was questionable. "The only thing that kills the play is penetration," Pederson said, "and we allowed the penetration to happen and stop the run." It wasn't the coach's finest moment. But Pederson did make the correct call later in the quarter when the Eagles faced a fourth-and-10 at the Dallas 38. He initially had his offense on the field with 1:38 left, but he sent Jake Elliott out instead. The kicker connected from 56 yards and the Eagles were finally on the board. Jake Elliott (center) had two field goals on Sunday. But, overall, it was an unacceptable first half. Three points is never enough. Wentz alone should warrant more than 132 yards of total offense. The Eagles were 0 for 4 on third down and were making the Cowboys defense look championship caliber. The lesson for Pederson was to give Wentz more opportunities to drop and to throw beyond ten yards. Some fans may clamor for more balance, but the Eagles simply don't have the horses on the ground and on the offensive line. On each of the first three possessions of the second half, Wentz drove the Eagles to points. He started to find his favorite weapon — Ertz — first for 12 yards and then for 21 yards. But on second down at the Cowboys 14, Pederson called for some trickery. He had Wentz throw a quick pass to Ertz, who lateraled to Tate, who gained six yards. It was a fine play and all, but why not throw to your best target in the end zone? On third down, Wentz was a tick off to receiver Alshon Jeffery just over the goal line and the Eagles settled for a short field goal and 13-6 deficit. Speaking of Tate, it was going to be difficult to get the veteran receiver up to speed less than two weeks after the Eagles acquired him before the trade deadline. But if that's an excuse, then why make the move with just eight games left in the first place? Pederson didn't do enough to get him involved and of the plays scripted for Tate, none worked. "We had a certain number of plays for him," Pederson said, "and wanted to get him into the game, and just get him some touches." They hardly did. Tate caught just two of four targets for 19 yards. Wentz and the offense did get rolling in the second half with back-to-back touchdown-scoring drives. Both ended with passes to Ertz — in the end zone of all places. But the Eagles' offensive energy came to a screeching halt with Clement's third down screen and finally when Ertz came up short on fourth down. Pederson has seven games — four in the division — to turn the season around. He's wading into difficult waters, and it feels like it is of his own doing — at least the coaching part.